FABULOUS Skillet Meal - perfect for a busy weeknight meal! We are freezing the base of the meal with the browned ground beef and tomato sauce. After it has been frozen, we will reheat the sauce and then stir in the pasta and stock and let that cook in the skillet. 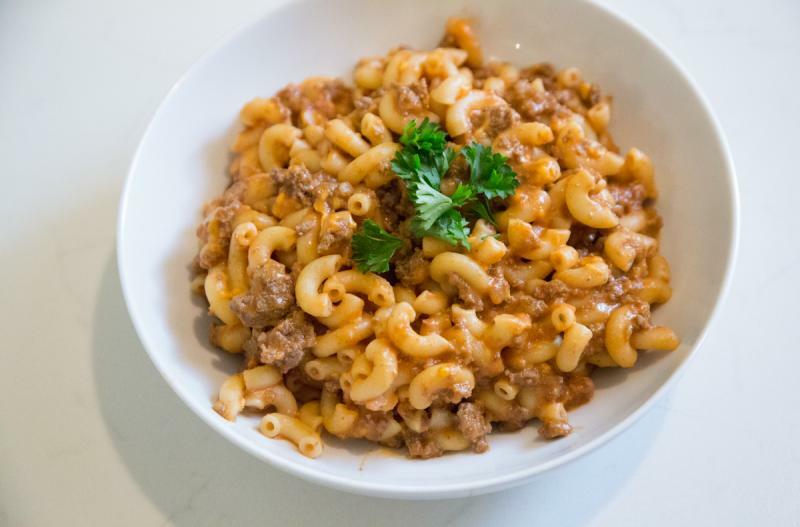 Once the pasta has soaked up all the liquid and flavor from the sauce, then you can stir in the cheese and let it melt into this delicious goulash. Enjoy! Stir in the crushed tomatoes, Italian seasoning, salt and pepper to taste. Bring to bubbling in the skillet. Bring to bubbling again, then cover with tight fitting lid, and let pasta cook for 10 minutes, or al dente. Immediately remove from heat, so the pasta doesn't overcook. Stir in the shredded cheddar cheese into the beefy pasta, and stir through to get it all melted. 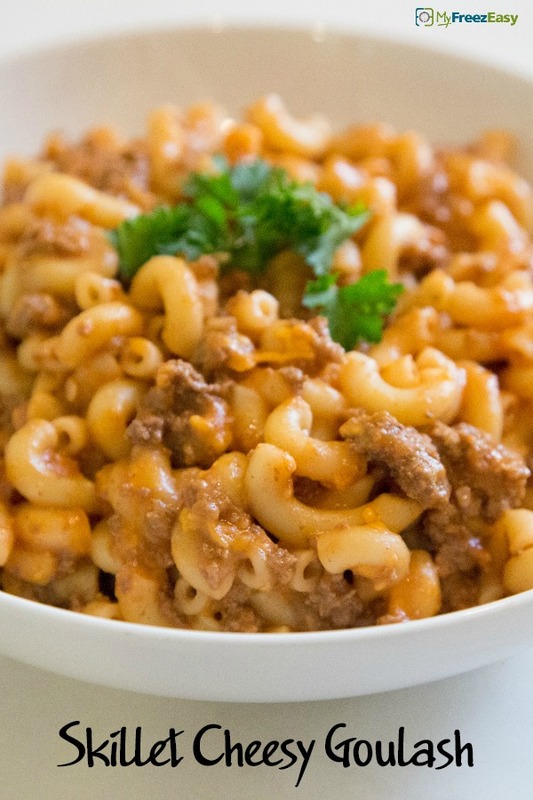 Serve Skillet Cheesy Goulash with side of veggies. Do not add pasta, beef stock or cheese to the freezer baggie. Put baggie in the freezer and freeze up to 6 months in fridge freezer or 12 months in a deep freezer. Thaw in the fridge overnight, or a warm bowl of water for about 20 minutes, before transferring to the skillet for reheating. Once warmed through, stir in the pasta noodles with the beef stock, cover with lid and cook pasta for 10 minutes. Stir in the cheese and let melt. Thaw and reheat in skillet. Once warmed through, stir in the pasta noodles with the beef stock, cover with lid and cook pasta for 10 minutes. Stir in shredded cheddar cheese and let melt.